The New York Times appeal of January 14, 1992. Three years after Linus Pauling’s 1988 visit to Yugoslavia, tensions in the country boiled over. Though it may have been justified in its desire to protect ethnic Serbs based on the atrocities that occurred during World War II, the incursion of the Yugoslav People’s Army into newly independent Croatia did little but add fuel to the conflagration. By the time a cease-fire agreement was brokered in 1992, several of Croatia’s major cities had been bombed and Dubrovnik, a city of major cultural importance, had been the target of several attacks. Even the institute where Linus Pauling delivered his 1957 lecture, “The Structure of Water,” came under threat of bombing in late 1991, as Serbian nationalists accused the institute of producing nuclear weapons. As the conflict broadened, Pauling began collecting media reports and analyses. One article, published in The European and titled “Lies Within the Balkan War of Words,” claimed that Croatia was exaggerating minor conflicts with Serbs in the area while using the media to portray themselves as victims in the eyes of the world. Raymond Kent, an emeritus professor of history at U.C. Berkeley, had brought this article to Pauling’s attention while cautioning Pauling that he might be the target of Croatian propaganda efforts due to his recent travels and the awards that he had received while in Croatia. Fax received by Pauling on November 18, 1991. The October 11th appeal inspired both respect and reproach from those harboring an interest in the widening crisis in the Balkans. The Croatia-friendly nature of the document drew both skepticism and outright condemnation from a variety of critics. Probably the appeal’s highest profile signatory, Pauling received several letters from colleagues as well as members of the community who felt compelled to express their shock and anger. Many accused him of outright ignorance, often citing World War II and the atrocities committed by Croatians against Serbians during that time period. Displaying the persistence that characterized his earlier peace activism, Pauling was neither intimidated nor did he show any signs that he was ready to back down. In a note to himself, Pauling described one encounter in particular with his old friend and colleague, Harden McConnell, and his wife Sophia. Harden McConnell, a former colleague of Pauling’s at Caltech and later a professor of chemistry at Stanford, frequently swapped papers with Pauling and had also stood by his side in protesting the Vietnam war. Likewise, Sophia McConnell had been close friends with Ava Helen prior to her death in 1981. That the McConnells disagreed with Pauling on the issue of Croatia did not seem to affect their friendship in the slightest. Notably, Pauling continued to nominate McConnell for multiple awards including, in 1993, the Nobel Prize for Chemistry. Where the appeal was concerned, however, Pauling strongly felt that he was aligning himself on the side of peace, and he was not afraid to voice his opinion on the matter. Calls to see the other side and accusations that he was portraying a multidimensional issue from only one perspective inspired little in the way of a reaction. While this tenacity of vision was typical of Pauling, his comment to Sophia reflected a hope that Pauling had always maintained for the future. A note to Pauling written on an LPISM fundraising letter and sent to Pauling by a donor. Perhaps nourished by his focus on discovery in his scientific endeavors, Pauling approached his peace work with the attitude that the only way humanity might make up for past mistakes is by creating a future in which these mistakes are not possible. Though he received a fair amount of criticism for the one-sided nature of the Croatia appeals, the spirit motivating Pauling’s involvement had little to do with choosing sides. Rather, he was much more interested in emphasizing the need for a better way to resolve world conflict, and he knew that this process began with awareness. Greeting card sent to Pauling by photographer Milena Sorée, November 1991. The affixed photograph was taken by Sorée in Croatia. As time moved forward and more information about the Croat-Serb conflict became available, Pauling began to receive less criticism and more gratitude. Several U.S.-based correspondents, as well as multiple Croatians trapped in war-torn parts of Yugoslavia, sent Pauling their thanks. Some of these were form letters, simply addressed “Dear Sir” or “Dear Colleague” with Pauling’s name filled in. Many more, however, were personalized cards or handwritten letters recognizing Pauling’s contribution toward a peaceful resolution of the fighting in Yugoslavia. In certain cases, even people who didn’t agree with Pauling’s stance recognized his good intentions and commended his willingness to raise his voice in the name of peace. Over time, new updates on the destruction in Yugoslavia came pouring in, as did requests that he “raise his voice again.” To this, Pauling responded by signing an even larger appeal, published in the New York Times and containing the names of over one hundred Nobel Laureates appealing for peace in Yugoslavia. Interestingly, only six laureates who signed had received their Nobel Prize for peace. Instead, the largest number of signatories had earned Nobel Prizes for their work in the sciences: thirty-four in physics, twenty-seven in chemistry, and another twenty-seven in medicine. This second appeal, published on January 14, 1992, appeared on a full page of the New York Times shortly before a cease-fire between Serbia and Croatia was declared, the fifteenth in a succession of many unsuccessful attempts to stop the fighting long enough to negotiate a formal agreement between the two countries. In fact, the conflict within Yugoslavia did not see any form of resolution until the year after Pauling died. A few months after the Nobel Laureate appeal was published, Pauling’s main contact in Croatia during his 1988 trip, Z.B. Maksić, issued a statement on behalf of the Croatian Pugwash group that capitalized on Pauling’s efforts to raise awareness. In the wake of the collapse of the Soviet Union, Maksić asserted that “communism is still alive and well in Belgrade,” a suggestion that struck a nerve in the western world and solidified many western opinions on the subject. In September 1992, the United Nations announced that it was expelling Yugoslavia until Belgrade recognized Croatia and Bosnia as independent nations, a statement that outraged Serbians. The conflict eventually came to a close with the Dayton Accords of 1995, at which the presidents of Bosnia, Croatia, and Serbia agreed on a generalized framework for peace in their troubled region. J.D. Bernal, Linus Pauling and an unidentified individual in Ljubljana, Yugoslavia, 1957. On October 11, 1991, an appeal appeared in The New York Times containing Linus Pauling’s name and a brief description of recent atrocities that had occurred in Croatia. At the time, Croatia was a newly independent country that was struggling, along with Slovenia and eventually Bosnia-Herzegovina, to maintain and strengthen its hard-won independence. Immediately following Croatia’s free elections in June 1991, the Yugoslav People’s Army had invaded and attacked on the grounds that they needed to protect Serbians living in the new Croatia. This conflict would later come to be known as the Croatian War of Independence. The New York Times appeal, originally conceived by Professor Ivo Banac, of Yale University and Stanimir Vuk-Pavlović, of Mayo Medical School, had less than thirty signatures on it, most of them from professors at major universities in the United States. It was Banac’s wish that the appeal exclude politicians, in order to keep the focus of the document on peace. In considering potential signatories, Vuk- Pavlović thought of Pauling first, and Pauling responded to the idea with speed and enthusiasm. Notably, poets Joseph Brodsky and Czeslaw Milosz, as well as actress Meryl Streep, also signed. Banac’s original goal in publishing the appeal was mainly to raise awareness, as many people in the United States knew nothing of the conflict. Likewise, since Croatia’s free elections resembled democratic elections, Banac felt that it would be relatively easy to drum up stateside support for Croatia’s efforts in the war against the Yugoslav People’s Army, which was a relic of communist Yugoslavia. It had not been that long ago, after all, that Yugoslavia was united under a single communist leader, Josip Broz, a major figure in twentieth century history who became more commonly known as Tito. Under Tito’s leadership, Yugoslavia had appeared to outsiders to be relatively peaceful. Europeans and Americans alike traveled to the country in the late 1950s and generally declared their approval as Tito rolled out his five-year plan, which was geared to catalyze industrialization and promote economic prosperity. Pauling himself visited in 1957 to deliver the opening address at the International Symposium on Hydrogen Bonding, where the lectures he subsequently attended inspired and invigorated him. It was Tito’s death in 1980 that brought about an era of chaos to Yugoslavia. Considered by many to have been a benevolent dictator who had governed the country since the conclusion of World War II, Tito did not leave behind an obvious successor. Amidst this leadership vacuum, nationalist sentiments within the communist party were quickly stripped away. Once the mask of national unification had been removed, a collection of serious underlying fissures was revealed. Centuries of conflict between different regions, ethnicities, and religions still existed within the country and, absent Tito, quickly widened to split Yugoslavia apart. Conflict between Croatia and Serbia seemed to many the greatest danger, due in part to lingering anger over the Croatian government’s alliance with the Nazi party during the second World War, an affiliation which led to the killing of more than 100,000 Serbs at the Jasenovac concentration camp and elsewhere. Worsening matters, throughout the 1980s, politician Slobodan Milošević gave a number of inflammatory speeches that served to stir up nationalist sentiments among Serbians. Linus Pauling and others at a vitamin C manufacturing facility at the Pliva Pharmaceutical Works, Zagreb, Yugoslavia, September 1988. Pauling traveled to Croatia in 1988 to receive a series of awards and recognitions (notable among them, an honorary doctorate from the University of Zagreb, which was only the sixty-second such degree conferred by the university in its 320-year history) as well as formal induction into the Croatian Chemical Society. Though none of Yugoslavia’s republics had yet made a decisive move toward independence, Pauling’s 1988 visit was riddled with evidence of political, social and economic instability. Most notably, during his 1957 trip, financial accommodations had been provided for himself and for Ava Helen, making his attendance at the hydrogen bond symposium not only possible, but comfortable. By contrast, his 1988 trip came about only after a series of conversations about financial assistance had been conducted. Throughout this process, Pauling’s primary contact in Croatia, Z.B. Maksić, made a few references to the financial hardships that were then widespread throughout Yugoslavia. Maksić answered Pauling’s request to bring his daughter and her husband with apprehension, and politely informed him that the pair would have to be covered by whatever means Pauling could supply. Pauling eventually applied for a Fulbright Grant, at Maksić’ suggestion, to cover their travelling expenses as well as his own. When this grant application proved a success, Maksić remarked that the monies had given Pauling “double coverage” and suggested that he use the funds to also pay for his own accommodations once he arrived. Despite these quibbles over money, Maksić and Pauling remained cordial toward each other, both during the trip and after. Regional interest was high in Pauling’s most recent book, How to Live Longer and Feel Better (1986) and, at Maksić’ request, he wrote a foreword to the Croatian edition later that year. Maksić later reciprocated by penning a dedication to Pauling in “Six Decades of the Hybridization Concept,” a collection of scientific papers from Yugoslavia that was slated to be published as an edited volume in the early 1990s. Ultimately, Pauling’s relationship with Yugoslavia was a positive one and he felt a strong connection with Croatia in particular after his 1988 trip was concluded. Torchlight procession in Oslo, December 1963. 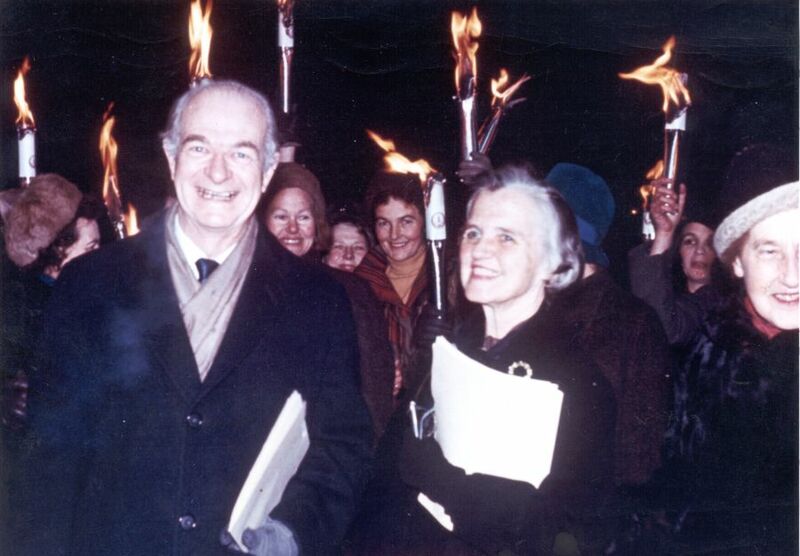 After the Nobel Peace Prize ceremonies had passed, Linus and Ava Helen Pauling remained in Scandinavia into the New Year, visiting friends and making several public appearances in the region. In the wake of his prize, Pauling continued to speak on the importance of peaceful international relations and also addressed scientific audiences. Often, the two would overlap. For the rest of the first week, the Paulings remained in Oslo where the whole family was able to spend some time together and mingle informally with others. On Friday, December 13th, the Paulings visited the Munch Museum, which had just opened to mark the hundredth anniversary of the birth of Norwegian painter Edvard Munch. Afterwards, they attended a luncheon hosted by the Norwegian Chemical Society. The weekend continued with informal meetings and a party at the home of Otto Bastiansen, who had helped the Paulings to plan their activities while in Scandinavia. 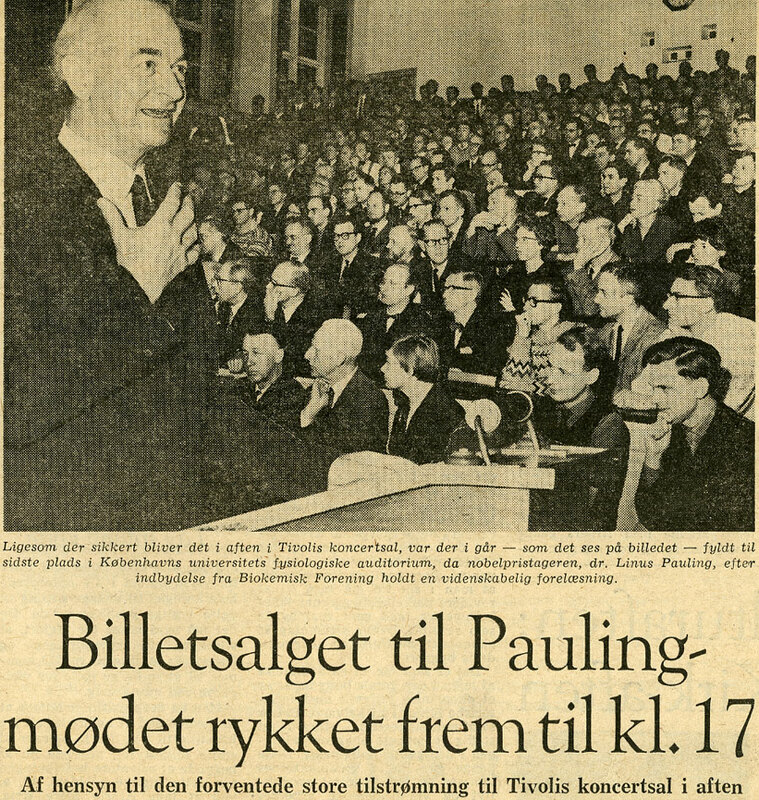 Pauling then referred to Aristotle’s assertion that nations were inherently immoral, suggesting that “Now they will become moral.” The next day, Pauling kept up his slate of public appearances by meeting with local high school students and by giving a lecture to the Trondheim section of the Norwegian Chemical Society on the role of molecular diseases in evolution. The Paulings spent the rest of the week in Sweden. Their first stop took them to Stockholm, where they were immediately met by a collection of prominent Swedish scientists and politicians. Later, Pauling addressed the press before attending a reception hosted by the local chapter of the Women’s International League for Peace and Freedom. Published in Land og Folk, January 3, 1964. The next morning, Linus gave another lecture on molecular disease and its relation to evolution, this time to the Swedish Royal Institute of Technology. In the afternoon, the Paulings visited the newly opened Wenner-Gren Center, which Hugo Theorell, head of the Nobel Medical Institute’s Biochemistry Department, described to Linus as representing “one of the many ways which have to be tried in order to improve mutual understanding and friendship between different people and races.” Devoted to scientific collaboration across borders and staffed by researchers from thirty countries, Wenner-Gren struck Pauling as a good example of how science could foster peaceful international cooperation. From Stockholm, the Paulings went southwest to Gothenburg and then south again to Lund, stopping at both cities’ universities to speak on his own path to becoming a peace activist. From there the Paulings returned to Oslo and enjoyed a more relaxed schedule over the holidays. 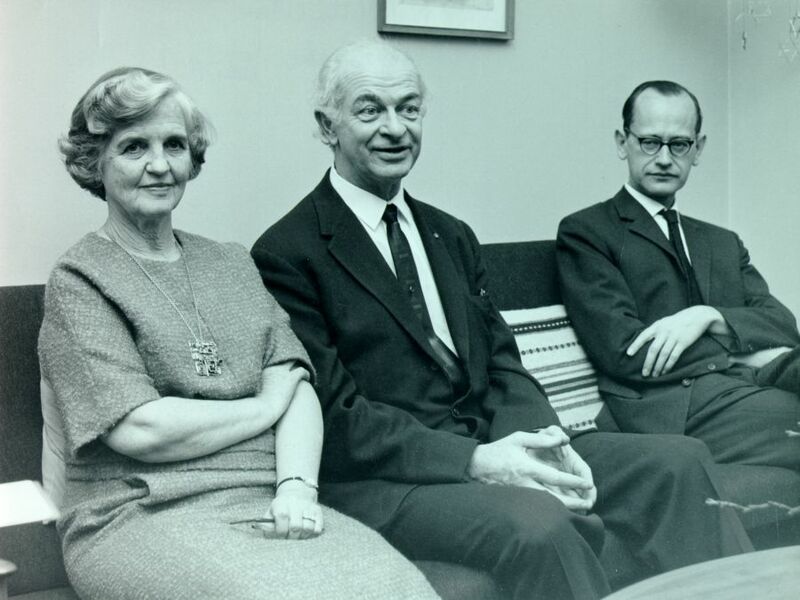 Ava Helen and Linus Pauling with Martin Ottesen, Copenhagen, January 1964. Before heading back to the United States, the Paulings spent one day in Copenhagen, where Linus would give one final talk on peace. According to a letter to Pauling from Gerda Ottesen – wife of Martin Ottesen, the director of the Carlsberg Laboratory – Pauling’s time there led to the nascent formation of a “Pauling Group” that endeavored to translate Pauling’s speeches and writings on peace into Danish. Ottesen also informed Pauling that he had become of interest to a newly formed political party which had emerged out of disputes from within the Danish socialist party. His mark clearly made in Scandinavia, Pauling headed back to the States. Published in the Pasadena Star-News, January 9, 1964. The media event concluded, the Paulings hurried back to New York City that afternoon so that they could attend a tribute held at the Hotel Commodore. Sponsors of the event included several scientists from around the world, as well as Bertrand Russell, Walter Cronkite, Senator George McGovern, and Arthur Miller. The gala was also attended by United Nations Secretary General, U Thant. If there were to take place tomorrow a 6-magaton war, equivalent to the Second World War in the power of explosives used, and another such war the following day, and so on, day after day, for 146 years, the present stockpile would then be exhausted. Published in the Philadelphia Evening Bulletin, January 10, 1964. The Paulings rested the next day and then took to the skies once more, this time destined for Philadelphia where they made two more public appearances. On Thursday, January 9th, local peace groups, including Women Strike for Peace and the Society for Social Responsibility in Science, sponsored another tribute to Pauling. In addition to hearing Pauling and others speak, those attending were also availed of the opportunity to sign pre-printed postcards addressed to President Lyndon Johnson which applauded his call for a “Peace Offensive” while also continuing to urge him to negotiate for complete disarmament. The following night, the local Women Strike for Peace chapter held a cocktail party in honor of the Paulings. The Paulings headed back to New York City on Saturday where they would attend one more reception in their honor, this time hosted by the Women’s International League for Peace and Freedom. On Wednesday they, at long last, flew back to California, thus concluding their five and a half weeks of travelling, lecturing, and celebrating in connection with Linus Pauling’s Nobel Peace Prize. Once home, Pauling did not rest for long: within days he was in public again giving speeches outlining what he saw as the “Next Steps” to reach disarmament and peace in the world. 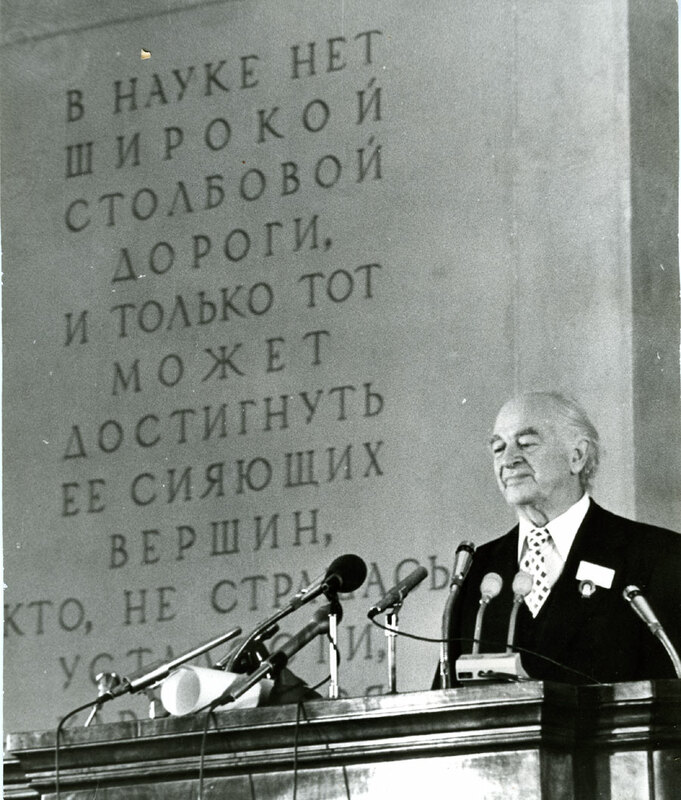 Linus Pauling lecturing after receiving the Lomonosov Gold Medal, Moscow, September 25, 1978. 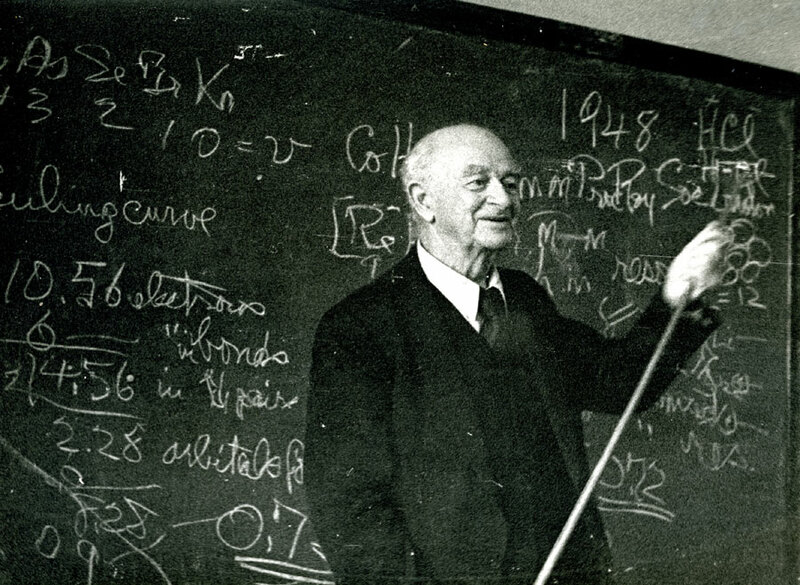 In 1967 Linus Pauling was invited back to the USSR by the Soviet Academy of Science (Akademia Nauk USSR) to join their general special meeting session in commemoration of the 50th anniversary of the Great October Socialist Revolution. He was not able to attend but, around the same time, he was also asked by the Academy to participate in the publication of Functional Biochemistry of Cell Structures, for which Pauling submitted a piece titled “Orthomolecular Methods in Medicine.” The paper discussed Pauling’s growing interest in the molecular basis of health and disease. In it, he delved into the benefits of orthomolecular study, providing both examples and rationale in support of an orthomolecular approach to medicine. The piece was published in 1970 and the volume edited by Pauling’s old friend A. I. Oparin. 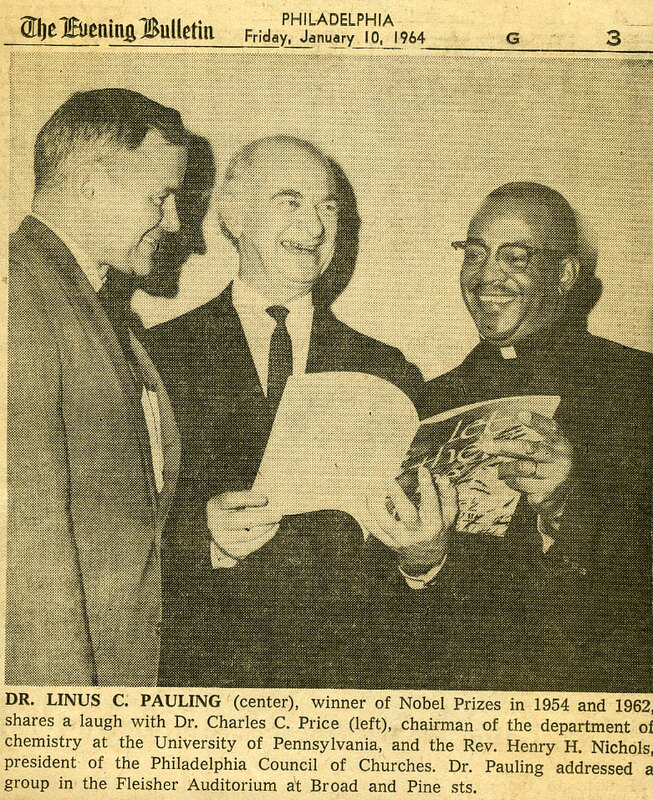 That same year, Pauling was honored for his peace activism with the International Lenin Peace Prize for 1968-1669, the Soviet Union’s most prestigious award for humanitarian efforts. Pauling was the fifth American to receive the prize since its inception in 1949, following the likes of W. E. B. DuBois and Rockwell Kent. Pauling was presented with the award by Soviet physicist Dmitry V. Skobeltsyn in a public ceremony held at the Soviet Embassy in Washington, D.C. In his acceptance address, Pauling emphasized the need to achieve global peace through international law and expressed growing confidence in the world’s ability to facilitate international relations without reliance on nuclear weapons. Outline annotated by Pauling concerning his appearance on “The 9th Studio” Soviet television program, October 21, 1975. While in Moscow, Pauling was asked to appear on a Soviet television program, “The 9th Studio,” alongside Bulgarian scientist Angel Balevski, Soviet physicist Nikolay Basov and Soviet philospher Dzermen Gvishiani. The round table was asked to discuss modern science, the prohibition of nuclear weapons and proliferation, and the struggle for peace. The program was broadcast to a potential audience of 80 million people throughout the Eastern bloc. Though the bulk of Pauling’s relations with the USSR focused on the pursuit of world peace and disarmament, many of his Soviet colleagues were also interested in his work with vitamin C. His popularity in this field provoked an invitation to return to Moscow in 1978 to give talks on ascorbic acid and chemistry. While there, he spoke to the Shemyakin Institute of Bioorganic Chemistry on his growing interest in using vitamin C in the treatment of cancer. He also presented to the USSR Academy of Sciences on vitamin C, and attended the International Symposium of Frontiers in Bioorganic Chemistry and Molecular Biology. 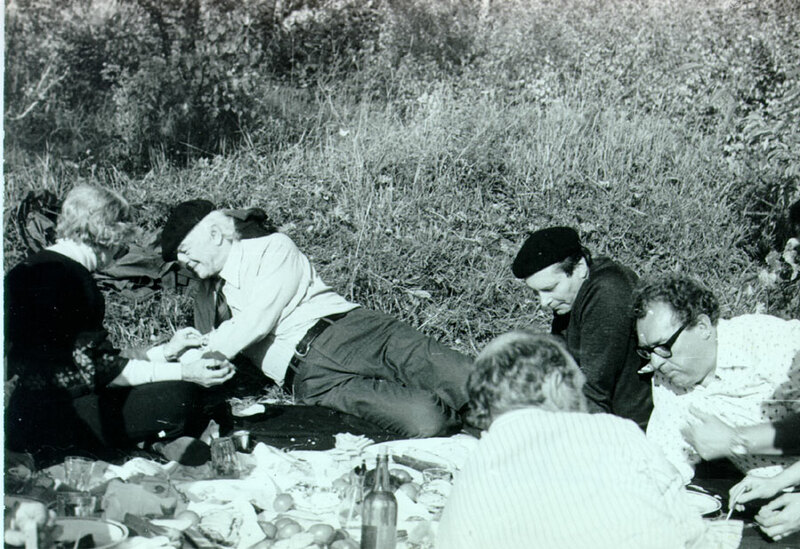 Ava Helen and Linus Pauling picnicking on the shores of Lake Baikal, southern Siberia, 1978. During this visit, Pauling was also awarded the Lomonosov Gold Medal, the highest award conferred by the Academy of Sciences of the USSR. Officially, the prize was given for his outstanding achievements in chemistry and biochemistry though, as stated in a letter from Soviet poet Mikhail Vershinin, the award was also in recognition of Pauling’s work as a “knight of peace and progress.” To commemorate the occasion, Pauling gave a lecture on the nature of the bonds formed by transition metals in inorganic compounds. In between this visit and his next trip in 1984, Pauling continued to think about the political and cultural norms developing in Moscow, writing a support notice for the book Give Peace a Chance: Soviet Peace Proposals and U.S. Responses and attending a conference, “What About the Russians?” that took place in Corvallis, Oregon. He also nominated two of his colleagues, Dorothy Hodgkin and Joseph Rotblat, for the International 1983 Lenin Peace Prize. Pauling in lecture to the Chemistry faculty of Moscow State University, June 18, 1984. Pauling returned to the Soviet Union for the final time in June 1984, during which time he toured the national biological research center and attended the opening session of another “Frontiers in Bioorganic Chemistry and Molecular Biology” conference. 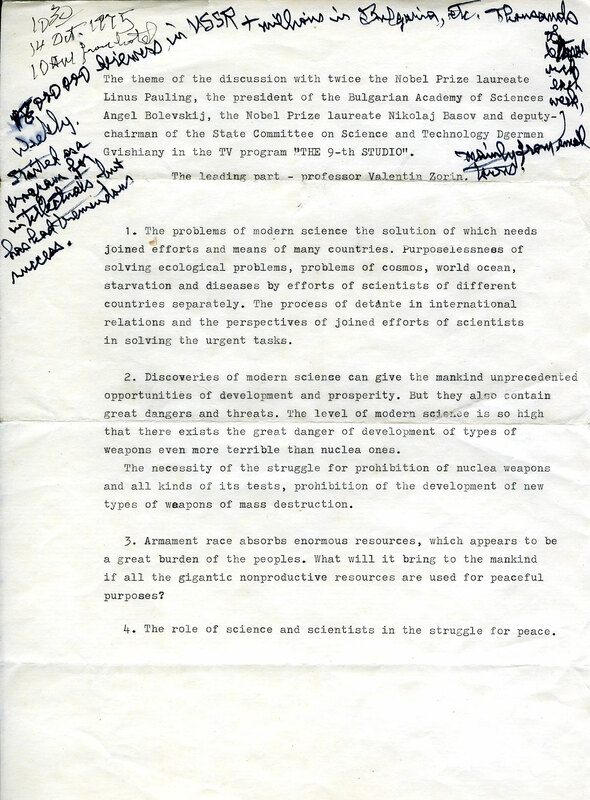 In this symposium he and others discussed research agreements proposed by the Union of International Research’s Committee of Human Relations for Peace and by the Academy of Sciences of the USSR. On this trip Pauling also attempted to arrange a meeting with Andrei Sakharov, the dissident Soviet nuclear physicist and humans right activist. At the time, Sakharov was effectively under house arrest and confined to his apartment in the city of Gorky. Pauling proposed that he meet with Sakharov in Gorky, but the request was denied. In his diary Pauling noted having been told by a Soviet official that “he was sure I could understand that a person with secret information might have to have his travel restricted.” So ended Pauling’s personal contacts with the U.S.S.R., a nation whose enchantments and flaws revealed themselves to Pauling, over the years, in near equal measure. 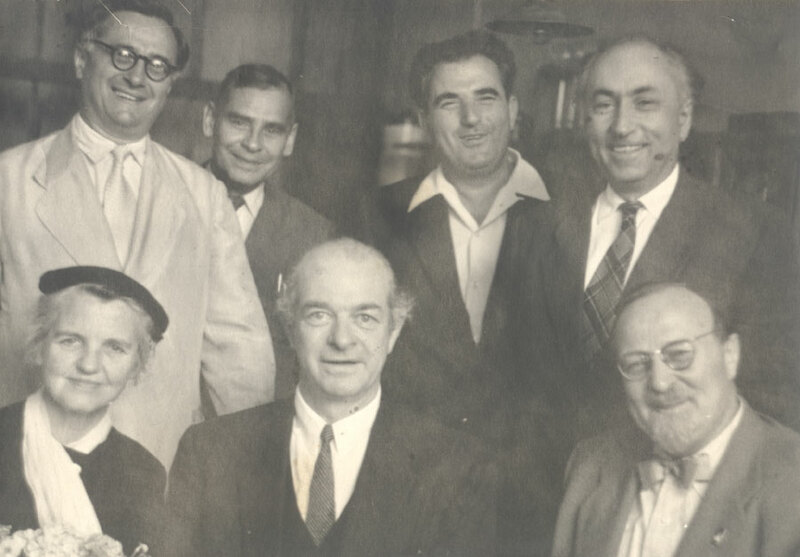 Ava Helen and Linus Pauling with Soviet colleagues including A. I. Oparin (front right) and N. M. Sissakian (back right), 1957. During their first stay in Russia, Ava Helen kept a private diary to record everything they did and saw – mostly museum visits, festival activities and dance performances. Included were trips to the Bolshoi Theatre to see a ballet, an opera, and an operetta. Other noteworthy excursions included the treasure house of the Kremlin, Cathedral Isaac, the Pushkin Museum and a Russian kindergarten. Of the visit to the kindergarten, Ava Helen noted that the children were presented in such an organized fashion – specifically in their music and gymnastics classes – that she had a hard time buying into what she was seeing and enjoying the visit. Something she did enjoy however, was watching the Youth Festival parade, one which featured spectacular performances and a breathtaking fireworks display. The Paulings made time to dine with Oparin, their primary contact during their visit, as well as their colleagues the Folkensteins, at the Savoy Hotel in Moscow. The duo also went to an old monastery, since repurposed as the Institute of Chemical Physics, to visit N. N. Semenov’s laboratory. This was just one of a number of laboratory tours, including visits to the nuclear physics lab in Moscow, Oparin’s lab, the Orekhovich Lab, and the Tatyveskis Geo-Chemical Institute Lab. 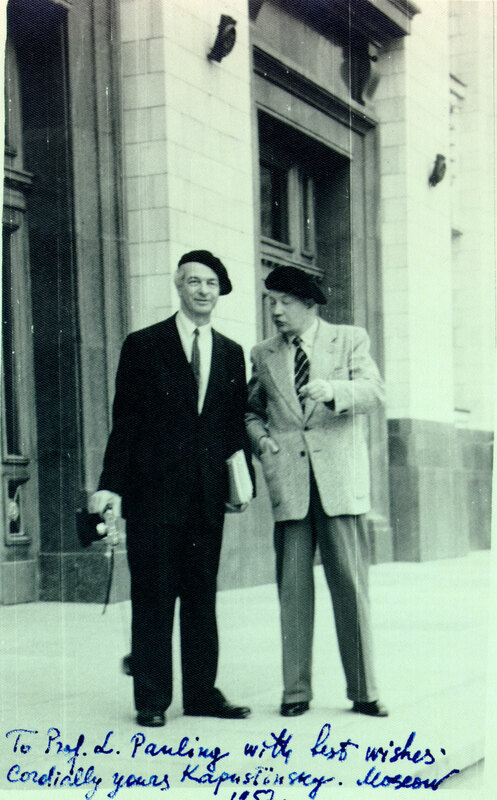 Upon returning to the U.S., his visit to Russia completed, Linus Pauling invited new colleagues V. N. Orekhovitch to and Vladimir Knorre to visit him at Caltech. It was not to be however as, in December, Pauling received a letter from the U.S. State Department informing him that Pasadena, San Francisco, and Los Angeles were officially closed to anybody holding a Soviet passport. Outraged by this action, Pauling called State Department official Lawrence Mitchell, urging him to arrange for Orekhovich’s visit to Pasadena. In response, Mitchell informed Pauling that Berkeley, California was open to Soviet visitors, but that the U.S. government could not very well make an exception for Orekhovich, as this would have “little effect in applying pressure on the Russian Government.” Pauling then proceeded to write to the Secretary of State, voicing his opinion on the situation. Pauling claimed that he felt very strongly opposed to this action because, “it gives the Russian scientists who come to the United States a false impression – the impression that we are a police state, where scientists are not free to talk with other scientists, but are ruled by the Department of State.” Orekhovitch eventually made it to the U. S. but was unable to visit Pauling or Caltech. About a month after Pauling wrote to the Secretary of State, he received a reply from Frederick T. Merrill, Director of the East-West Contacts Staff. In it Merrill reiterated Lawrence Mitchell’s original argument. According to Merrill, it was within the seventeen-point policy of the United States to increase contacts with peoples of Eastern Europe, but this policy had been rejected by the Soviet Union. As such, until negotiations could be revived on the matter of the barriers that had been raised by the USSR to contacts between the two countries, the United States had to restrict Soviet travel as a way of pressuring the USSR into negotiations. Soviet Academy of Sciences, Certificate of Membership, 1958. In 1958 Pauling was elected a foreign member of the USSR Academy of Sciences (Akademia Nauk USSR), the second American to receive this honor. Asked for a statement on his selection, Pauling conveyed gratitude to the Academy and commented on the great importance of improving international relations. Since his stance on matters of international relations was well known, colleagues and other figures in Russia wrote to Pauling encouraging him to continue to fight against nuclear testing in the United States. The Paulings made their second visit to Moscow in November 1961. While there, as an elected member of Akademia Nauk, Linus Pauling gave a speech titled “World Cooperation of Scientists” at a conference hosted by the Academy in celebration of the 250th anniversary of the birth of M.V. Lomonosov. In his speech, Pauling discussed the approaches taken by Lomonosov and other Russian scientists to atomic investigations into the structure of matter. He also commented on the contributions that Soviet scientists had made toward world peace, and reflected on the need to reconsider the Soviet Union’s official decision on Pauling’s chemical theory of resonance. In response, Pauling had written to Akademia Nauk arguing in support of his theory and asking the organization to reconsider. In 1954 the Soviet group eventually consented to a written debate of the theory between Professor N. D. Sokolov and Pauling – a debate which never actually took place. By 1961, when Pauling gave his lecture on resonance to a Soviet audience, technical facets of the theory remained controversial within the chemistry world and as such provided good fodder for conversation among scientists, irrespective of the political aspects of the debate. While in Moscow, Pauling likewise gave a talk in which he urged the Soviet Union to end its nuclear testing programs and address its stockpiles of nuclear weapons. He also attended a panel discussion at which he once again called on the Soviet government to halt all nuclear tests. Ava Helen attended these events with her husband, but once again found time for adventures of her own. As before she kept a diary during the 1961 trip, most of which is devoted to her husband’s presentations. A substantial portion of the diary is, however, dedicated to documenting the “wild rides” that she experienced with her guide, one Angella Gratcheva. Apparently Gratcheva drove very erratically, and while navigating the Russian roads commonly recited poetry, sang songs and engaged in very animated conversations with Ava Helen. Her driving was so unpredictable that the police stopped them, a “misunderstanding” that the guide cleared up with more animated speech. From scientific controversy to peace activism to crazy driving, it would seem that Russia proved to be an interesting place indeed. 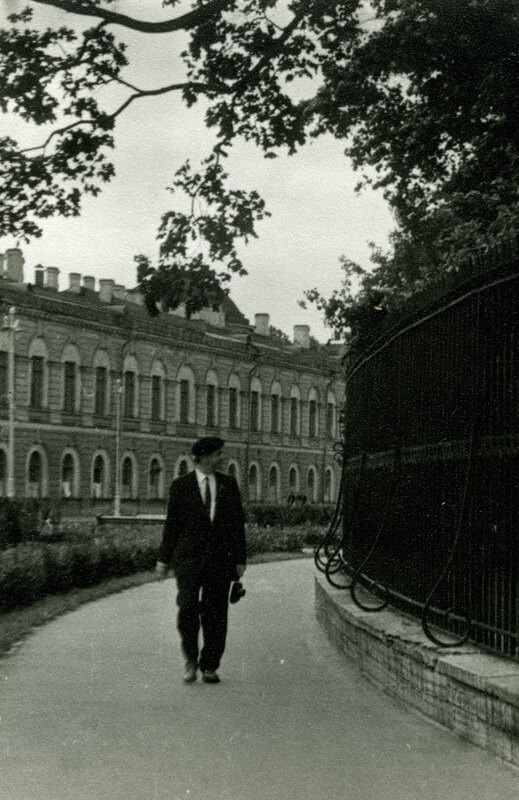 As with much of his international travel, Pauling’s relationship with the Soviet Union and its scientists grew stronger with each visit. The 1957 and 1961 trips set the foundation for Pauling to be viewed as a respected figure in the U.S.S.R., established precedence for future visits to the country and strengthened his position as an advocate for peace in both his home country and its rival nation. Linus and Ava Helen Pauling traveled to the Soviet Union six times between the years 1957 and 1985. 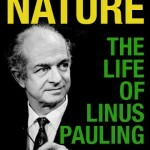 For the most part, Linus Pauling’s relationship with the Soviet Union was steeped in science, but he did speak on peace issues and the need to cease nuclear tests during his travels through the USSR. Unlike many of his peers, Pauling did not see the Soviet Union purely as a threat, but chose to view it instead as a potential, and vital, partner in peace. Likewise, most of the Soviet scientists with whom he interacted were viewed as having pure motives for advancing their research agendas. Unfortunately, Pauling’s cordial relations with contacts in the Soviet Union caused others in the United States to be suspicious of his own true motives and political affiliation during the decades of the Cold War. For those inclined to criticize Pauling, one group that raised eyebrows was the National Council of American-Soviet Friendship, of which Pauling was a member. For his part, Pauling affiliated with the group out of hope that it might live up to its name. Specifically, in a letter to the Council, Pauling expressed his desire that the council assist in establishing scientific links, particularly with respect to chemistry and medicine, between the Soviet Union and the United States. He believed that, above all else, the two countries needed to cooperate and ultimately desired to see an exchange of professors and students between the USSR and the US in near the future. 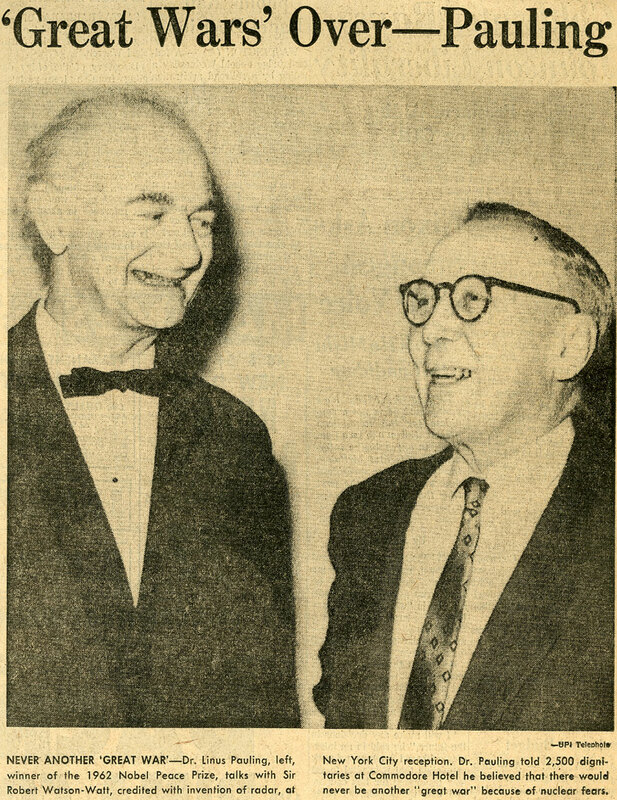 Pauling was also invited to attend the meetings of the Russian-American Club of Los Angeles. At one such gathering, in November 1945, he delivered a speech encouraging that the two countries work together in order to attain peace between all nations. Pauling likewise participated in events sponsored by Progressive Citizens of America, a group considered by some to be communist. Generally speaking, Pauling was not one to take fright at the specter of communism. Whether or not this meant that he agreed with communist ideals was a matter of continuing debate during his life. A reasonable assessment might be that he had a very tolerant outlook of it all, truly believing that communism was not anything to be worried about; that it was just a set of ideals holding sway in another country and that those views should not affect scientific or diplomatic relationships between the United States and the Soviet Union. He was not naïve though. He was well aware that Moscow was not an innocent player on the world stage. Indeed, he believed them to be recalcitrant, but thought if the United States were to take the first step towards initiating peace, only good could result. At home, these ideals only served to grow others’ suspicion of him. The start of the 1950s brought about the first wave of false claims being levied against Pauling and the sharpening of the FBI’s keen eye upon his activities. Newspapers would declare that he participated in communist activities and in 1955 declarations were made against him, especially by Louis F. Budenz, that he was a concealed communist. This charge in particular bolstered his FBI file, causing him to be watched and investigated for connection to any activities that may remotely have been related to communism. 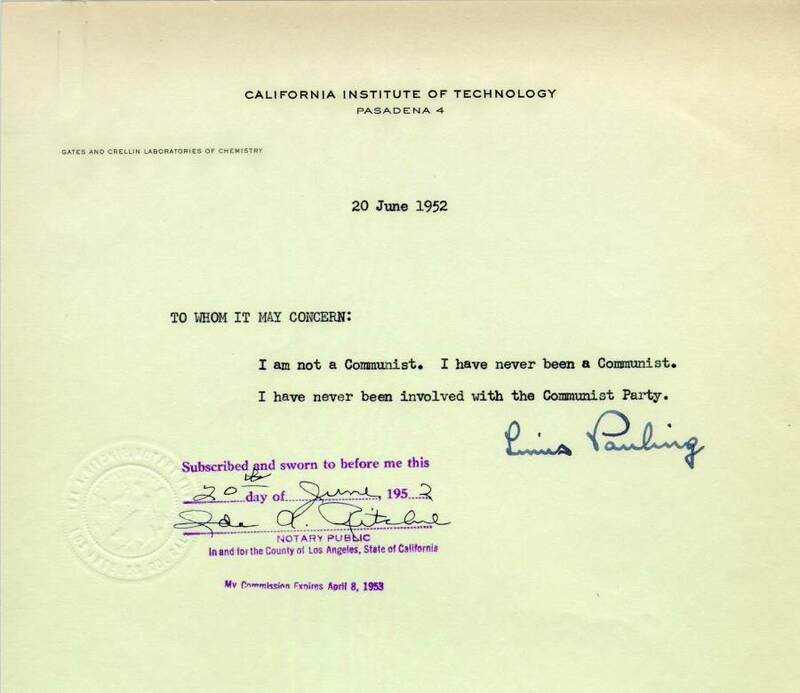 On June 20, 1952, Linus Pauling officially denied Communist Party membership. Despite this denial, the FBI still maintained a close record of his associations, investigating and attempting to interpret his activities. Despite this, the Bureau had trouble finding current sources that would identify Pauling as a past or present Communist Party member. Effectively, the investigators were operating off of the testimony given by Budenz – a former Communist Party functionary – that Pauling was a concealed communist. Budenz also claimed that Pauling made monetary contributions to the party even though he was not openly a member. Pauling denied these allegations, stating that he was not a member and not a contributor, but was an advocate for the inclusion of Soviet scientists in international conferences and symposia. In the climate of the time, even this level of support was grounds for reprimand. Another action that contributed to suspicion of Pauling was his appeal to the White House for the commutation of the death sentences handed down to Julius and Ethel Rosenburg. Pauling was keenly interested in the Rosenberg case and read widely of the details underlying their sentencing. His actions on their behalf were based in his analysis of these details, an analysis that led him to conclude that the death sentences were extreme and unjust. But no matter the reason, these sorts of actions made it difficult for him to convince others of his trustworthiness and his lack of association with the Communist Party. When he did give anti-communist statements in his speeches and talks, they were branded as being too weak. The pressures on Pauling built up to the point where traveling overseas became extremely difficult. He was famously forced to issue an oath that he was not a communist in order to receive a limited passport to travel to England in 1952. Institutions also began to reject his affiliation with them, including the University of Hawaii, which rescinded its invitation to Pauling that he speak at a building dedication in 1951. Eventually the climate of fear that permeated the Red Scare began to fade and it grew easier for Pauling to travel and to issue opinions on the Soviet Union that strayed from mainstream orthodoxy. Finally, in 1957, he made his first trip to the USSR where he was at last able to meet with many of the scientists whose right to participate in international meetings he had advocated over the much of the previous decade. 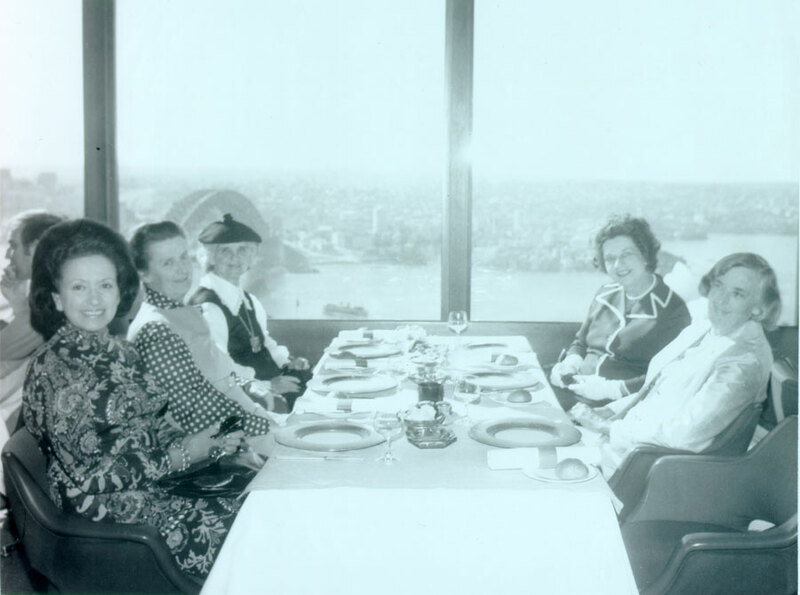 Ava Helen Pauling with a group of women at a restaurant overlooking Sydney Harbor. Australia trip, May 1973. In early 1964, China conducted its first nuclear test, an event that catalyzed the second Australian Congress for International Cooperation and Disarmament, which took place in Sydney from October 25-30, 1964. Organizer and Australian peace leader Professor Sydney Wright extended an invitation to the Paulings to attend this gathering which they gladly accepted, hoping to arrive early to sight-see around Australia’s less populated northern and western regions. As in 1959, the second conference was shrouded in controversy. This time the Australian federal government refused to grant visas to the two delegates that were from Iron Curtain countries, Russian Orthodox Church Archbishop Alexei and Mayor of Leningrad Mr. Isaev. 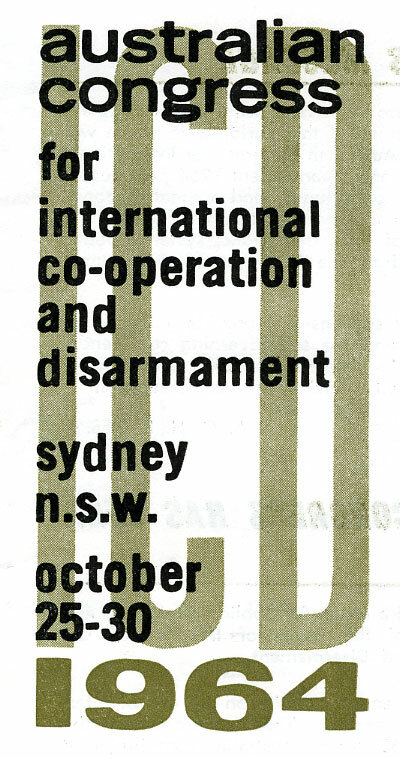 While it was no secret that Pauling already did not hold the Australian government in high regard, the barring of the Soviets from the conference caused his opinion to go “right down because of this action,” saying “there is no excuse for this backwards attitude.” By this point in Australia, certain smaller-scale social events had become political in nature too: the Lord Mayor of Melbourne, for one, outright refused to hold a civic reception for overseas guests of the congress. At the meeting itself, the Paulings gave two key lectures. Ava Helen delivered a seminar about international cooperation at the citizen level and Linus spoke of the threat of nuclear and biological war, with much of his talk centering on the heightened risk of cancer resulting from nuclear testing. Around the time of the congress, France had forthcoming nuclear tests planned for locations in the Pacific Ocean. According to Pauling’s estimates, the radiation emanating from these proposed tests would deleteriously affect 500,000 unborn children. This was a hot topic for discussion and inspired the congress to organize a large rally. Ultimately, an official count of 4,000 people (Pauling estimated 6,500) marched through the streets of Sydney, representing diverse groups including trade unionists, educators, writers, academics, and churchmen. Noticeably absent were representatives of Australia’s political parties. After the conference in Sydney, the Paulings headed north to the Queensland territory for a stay in Brisbane. They had actually already made a stop in the city two weeks prior, when Linus lectured on the molecular theory of anesthesia. This second visit was a busy one, filled with rallies, lectures, dinners, and receptions. On their first day, a local television station filmed “An Evening with Professor Pauling” special, a round table discussion with Pauling chaired by the Dean of Brisbane. Later that afternoon, the couple attended a Lord Mayoral reception, delivered addresses at a public rally and attended a supper party. The next day had them meeting with executive members of the Women’s International League for Peace and Freedom and the local Trades and Labor Council, and ended with Dr. Pauling lecturing at the University of Queensland. Before departing Brisbane, the couple picnicked in a rainforest. From there, the duo traveled to the other end of the country to visit Adelaide, in the southern region. In Adelaide, Pauling met with the South Australian Peace Committee and caught up with others involved in the Pugwash Conferences. Meanwhile, Ava Helen spoke at town halls and addressed a Women’s Luncheon. Also a part of their itinerary were stops in Melbourne, Perth, Sydney and Canberra. At the University of Melbourne Linus was awarded an honorary degree, which he accepted with his “Science in the Modern World” stump speech. It was a hectic time for Pauling as he’d given three lectures in Perth the day before and was bound for Sydney to deliver another lecture later that night. In Canberra he was recipient of a Key to the City. He also gave a highly technical lecture on nitrogen-oxygen bond lengths and the diffusion of ions through oxides. All par for the course for a man of many interests. The Paulings returned to the region a final time in the spring of 1973 on a trip organized by the Royal Australian Chemical Institute. The Institute had previously invited Linus to visit in the early 1960s but Pauling was unable to accept the invitation. The 1973 tour had two main purposes: to help inaugurate a new chemistry foundation and to give a series of lectures about recent advances in orthomolecular medicine. As with before, this trip saw the Paulings visiting a number of universities, namely in Sydney, Canberra, Melbourne, and Hobart. Pauling posing with sixty-seven glasses of orange juice, which would provide the equivalent of his daily vitamin C intake at that time. The Age (Australia), May 18, 1973. The couple arrived at a townhouse in Sydney at the end of April where they spent the following two weeks. On their first day they kicked off their visit with newspaper, radio, and TV interviews. Over the course of their stay, Pauling delivered several lectures on orthomolecular medicine and met with the Sydney Group for Social Responsibility in Science. After a busy few weeks in Sydney, the Paulings arrived in the capital city of Canberra. While there, Pauling, who at that point in his career was heavily promoting the use of vitamin C, met with the Mister of Health. Then in Melbourne, Ava Helen lectured at a luncheon held by the Women’s International League for Peace and Freedom. She spoke on “The Quest for Peace in America” to the many different NGOs, peace and conflict resolution societies, and service organizations in attendance. While in town the couple also reunited with members of the Australian Congress for International Cooperation and Development. While the purpose of Pauling’s visit was not necessarily political, French nuclear tests were at the forefront of current issues and Paulng’s opinion on the matter was often queried. Unsurprisingly, he voiced his support when Australia appealed to the International Court of Justice to halt the tests taking place in the Pacific. He also spoke to the Attorney General, Senator Murphy, and announced that he would back Australia’s case at the World Court. This favorable opinion of the government’s actions was a turn-around from previous years, during which the government’s knee jerk fear of communist influence was a consistent source of consternation for the Paulings. The last leg of the trip consisted of a few days in Tasmania, Australia’s small island state. The couple arrived there in the city of Hobart, where Pauling delivered a university lecture, and after which he and Ava Helen were whisked off to the Tasmanian wilderness. They toured the remote area of Strathgordon and stayed a couple nights in a chalet on Lake Pedder. Strathgordon is located in the Southwest National Park, an area known for its natural beauty and attractiveness to tourists looking to fish, bushwalk and rock climb, among other activities. It was a lovely way to end their visit, the final one that they would ever make to Australia.